I mean, seriously, really good. Okay, so I didn’t get caught. But you’re still going to at least consider my Christmas wish list, right? Especially if I don’t ask for too much? Because there are seriously just a few things I would love to have this year. Starting with DNA. Not too very much. Just from specific target families. • The Faures of Manakin Town, Virginia (YDNA): My third great grandfather Jesse Fore may well be a descendant of the Widow Faure and her children who were part of the Huguenot migration to the New World in the very early days of the 18th century.1 We have lots of YDNA samples linking a group together… but haven’t yet located a documented direct line male descendant of the Manakin Town Faures to test against. Truly, Santa, I would happily — happily — pick up the tab for YDNA testing for any candidate who fits the bill here: a direct line male descendant of the Manakin Town Faure family, surnamed Faure, Fore, Ford or some variant. • Matthew Johnson (YDNA, autosomal): Jesse Fore’s daughter Mary “Polly” Fore married Matthew Johnson in Union County, Georgia, in 1839. From the tax and census records, we have reason to believe that Matthew was born in Virginia around 1813, he was a shoemaker by trade, he fathered eight known children — and he died somewhere in 1863 or 1864 in Pulaski County, Kentucky.2 And that’s it. That’s all we know. Not even a hint as to his parents — and with the name of Johnson and not even a county in Virginia to focus on, well, we don’t have much to go on. Since I descend from a daughter, my folks’ YDNA won’t help here. So, Santa, a documented direct line male descendant of Matthew’s would be awfully nice to find under my tree. Matthew’s sons included Napoleon Bonaparte, James and William Johnson and they all settled in Parker County, Texas, by 1870. A grandson was Texas Ranger Captain Frank Johnson. And since an older descendant might be close enough to match, I’ll not only pick up the tab on a YDNA test — but an autosomal test as well. From the name and other evidence of the language spoken at home, we’re pretty sure Philip was German — the last name may well have originally been Schuh — and we’d love to have a documented male descendant to YDNA test. I know I’ve got a kazillion Shew cousins out there — so, Santa, please… just one who’s willing to test? 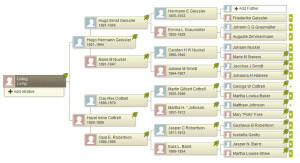 Since it really helps in working with autosomal results to be able to identify which parts of your DNA come from which ancestors, I’d really love it, Santa, if some of the oldest descendants of William or Gilford would be under my tree this Christmas, to be tested against Martha Louise’s descendants. Now Margaret — born, we think, in the interim between William running off with Ann and their marriage — may well be Ann’s daughter. But to prove it, Santa, I need a direct female line descendant of just one of Ann’s known daughters (Samantha, Julia and Charlsey) to be under my tree. A daughter of a daughter of a daughter, Santa. • The Cottrells of Madison County KY (YDNA): Last but not least, Santa, my Cottrells. Now, Santa, you know that I’m not sure there ever were any Cottrells in Madison County, Kentucky. But you know my second-great-grandfather-nemesis George Washington Cottrell said he was born there in 1821.11 So if there really was such a family in that county at that time, and there’s a living breathing male with the Cottrell name in the direct male line from that family, I’d happily pay for a YDNA test (and probably an autosomal test too). I’m willing to pay for it, Santa. Oh, not with good behavior. You know me better than that. But for the testing, okay? Seriously. If you could just find me one person in each of these categories, I’ll pay for the test — all the person has to do is comment below or email me. Hope Santa brings you at least a couple of items on your wish list…..Merry Christmas and Happy New Year. And a heartfelt thank you for your wonderfully informative blog! Thanks so much for the kind words — and the good wishes! Merry Christmas and Happy New Year to you and yours! Cheers for the holidays Judy, all best wishes in 2014! I learn so much through your posts – it’s my #1 genealogy blog to recommend to others. Thanks so very much for the kind words, Celia, and hope your holidays are as happy as you could possibly want! It might not help with your mtDNA on Ann Jacobs, but I descend from your William Battles’ father, Noel William Battles and his wife Elizabeth Hopper through their son Samuel Battles who m/ Nancy Wright, presumably the sister of that Keziah Wright. And I have DNA tested at Ancestry and 23andme & uploaded to Gedmatch. If we were a match to each other, it could be Battles vs. Wright, but if we could parse it out to determine it was Wright vs. Battles, would that not then confirm (for example) that your Margaret descends from Keziah Wright vs. Ann Jacobs? It wouldn’t be as good or as precise I guess as finding a descendant of your Ann’s daughter, and my brain hurts just from thinking about it, but if Santa didn’t bring that item on your list, maybe it could help to a degree. I don’t see you in my list of Ancestry matches (looking for something similar to Judy G. Russell), but am still scanning using the Chrome browser. Look me up under Briana5555 on Ancestry or Geneaholic on 23andme. Noel and Elizabeth are my fifth great grandparents, Brianna, so that’s a pretty distant relationship, but worth looking at with various options at GedMatch (I don’t see you on my match list at Ancestry or 23andMe either). I’d appreciate it if you’d send me ([email protected]) your Gedmatch kit number. I’ll reply with mine. And are you a direct female descendant of Nancy Wright? If so, may I ask what your mtDNA haplogroup is?